Our whirlwind trip lasted only 48 hours but we were able to get the flavor of Vermont and some of the island towns along Lake Champlain. Rumor has it there is a supposed sea monster in Lake Champlain nicknamed Champ. As the full-fledged nerd that I am I couldn’t resist watching for a glimpse of him while traveling along the shore line. We picked up our race packet at a local outdoor sporting store called the Skirack. After that we stumbled upon the Burlington Fall Farmers Market at the most perfect moment, during the height of their apple harvest. The apple is a big deal in Vermont! Apple cider, Apple cider doughnuts, Apple crisp the list goes on and on. We then of course had to take a gander fall foliage along the Green Mountains. All I can say is WOW. Vermont does not disappoint. The Green Mountain Marathon took place in the tiny town of South Hero population 1700. It had one of the cheapest race fees of any marathon I’ve been to in my travels which always speaks to my penny pinching heart. Although, I would have paid an extra shilling or two for more porta potties along the race course. A pre race pasta dinner was held at the elementary school /community center the night before the race. The 7th and 8th graders were so adorable while they served each course of the meal with a blend of eagerness and awkwardness as they tried on a more adult role. The 8:30am race start (a bit later than most races) was a double edged sword. It was great because a little more shut eye is always a good thing but bad if you are trying to catch the once a day Jet Blue flight out of Burlington. I literally ran from the finish line, hopped in my car with my wife Lynette (engine running) and zoomed to the airport, dressed and sponged off in the backseat and got there just in time before they closed the door. Yes I was THAT stinky guy on the airplane. I haven’t been getting nervous at my marathons for a long time but I did feel nervous at this one. I’m not sure why. I felt the same energy every marathon ignites, the weather was perfect, the crowd was really great, volunteers were wonderful but for some reason I felt nervous. It might’ve been because my last marathon ended so poorly with a finish time of ten plus hours. Of course there was the pressure that I HAD to finish this one in order for my 50th state to end with Florida (which I am sponsored to run. I’m sure the sponsors Cigna/Achilles will want the extra publicity that my 50th race should produce). It was a perfect fall day and the entire course was lined with vibrant autumn trees. The course was relatively easy the first 13 miles and felt like it was mostly downhill. But as it goes when we made the turn around after the first half it was of course mostly uphill going back. Thank goodness there was a small breeze on my back that helped me out. I actually ran the second half faster than the first half which never happens. As with all races I meet interesting people and a few funny people. I ran several miles with a local half marathoner named Claire originally from England I don’t know if it’s because I’m getting older or what but I can’t seem to catch age anymore. When Claire first ran up next to me and started talking I assumed she was about 18 years old. It turned out she was in her mid 30s and has lived in America for over 16 years. She met her American husband while he was a student in England. The two of them fell in love and got married and after a year they moved back to the states and she’s lived here every since. She said she has no desire to go back to England because she loves it in Vermont. Which when you think about it makes perfect sense to me. Lynette and I were talking about how Vermont reminded us of England because the people were quite preppy and very polite. I was entertained by one of the city’s policeman, even though they had laid cones out on the road for our protection he warned me to be careful because they probably wouldn’t do me any good. I was most likely going to get run over anyway. We both laughed I asked him if I could borrow his pistol just in case for protection but he said umm No. We laughed. I was a little serious though. All in all the Green River Marathon was great. Much to my dismay I did not see Champ but I’m feeling like a champ by completing my 48th state. 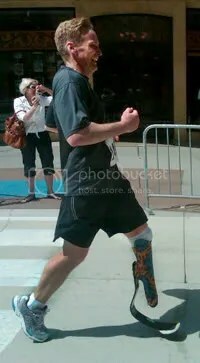 Posted in 50/50 Marathon Club, Adapative Athlete, Amputee Costume, Marathons, Vermont, vermont, adaptive runner, champ, sea monster, green mountain marathon, amputee,Tagged featuredBookmark the permalink.